A prompter for everyone, every need, every budget! The widest selection of reliable, affordable teleprompters for the beginner to pro. Designed and assembled in the USA with prime American-made beamsplitter glass. We have the widest selection of reliable, affordable teleprompters for the professional and consumer marketplace. You decide what combination of features and what price point suits your specific needs. To learn more about each product line, click the blue buttons below, and watch the video below for help in choosing the right teleprompter for your needs. Designed and assembled in the USA with prime American-made beamsplitter glass. 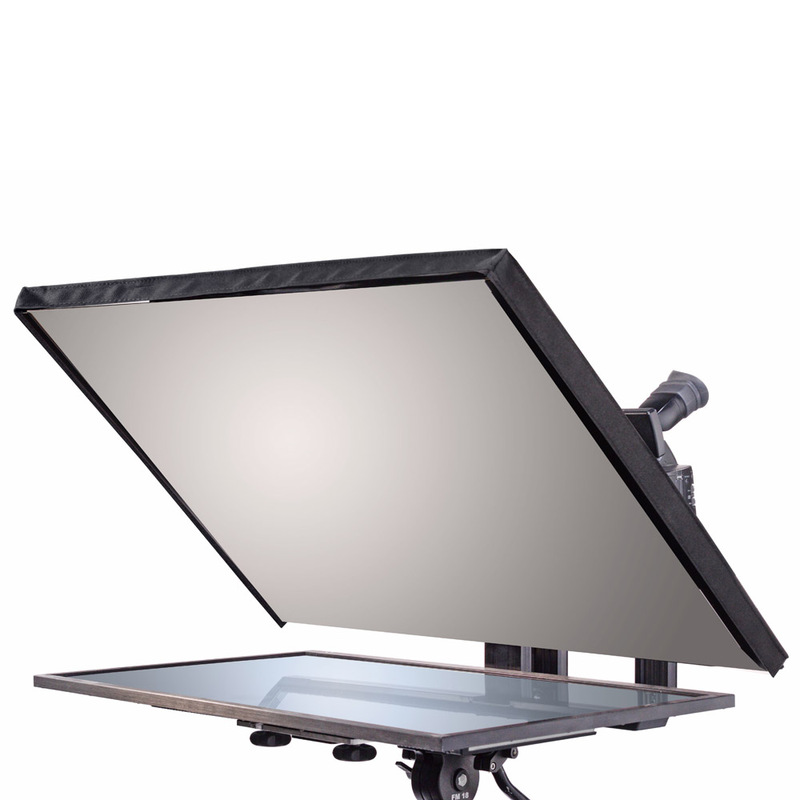 The professional's teleprompter choice for lightning fast setup and ultimate adjustability with finger tip control. High quality, lightweight and easy to use teleprompters at an unbeatable price. Lightest iPad teleprompter available with a universal cradle that adjusts for nearly any size tablet - iPad or Android. The first and best teleprompter designed for robotic cameras. Wide screen glass is easy to read even with slide presentations. Designed specifically for cameras with green screen light rings. Inexpensive teleprompter alternative to thru glass prompters. Lightest weight, lowest cost and easiest teleprompter to set up. Battery operated LCD can also be used as a viewing monitor. Sets up on it's included stand - no heavy duty tripod needed. Just place your camera behind and teleprompt. Make your talent look presidential with our line of professional quality speech prompters. Fingertip control of glass for quick adjustments. The largest teleprompters on the market. Readable at ranges up to 50 feet and beyond. From broadcast to one-man operation, Prompter People is your best choice. Our teleprompting solutions have been real-world tested to be be simple to set up/tear down and work reliably every time. Whatever your need, big or small, we have the best teleprompter solution. Need help choosing? Tech support? We're here for you. Whether you use a Mac, PC or iPad we have your perfect solution. After the sale, you'll get great phone and internet-based support. If there is ever a problem, we'll make it right. that we’ve helped more than 35,000 customers solve their teleprompter challenges. Since 2003, Prompter People has been supplying the teleprompting needs of studios, companies, non-profits, churches and more. Why do so many people choose Prompter People when they need a teleprompter? Our teleprompters are designed by people with decades of production experience. Designed to be simple to set up and intuitive to use. We provide internet and phone support for all customers without any additional charge. Prompter People has a reputation for high post-purchase customer satisfaction. We provide both Mac and PC software with each prompter we sell. Join 30,000 others and select your teleprompter today. !